Translated as “Seventy-two Seasons,” this restaurant’s name refers to the five-day “seasons” that make up the ancient Asian lunisolar calendar. Chef Akio Saito follows the subtle shifts of those seasons, making use of organic produce from across Japan. 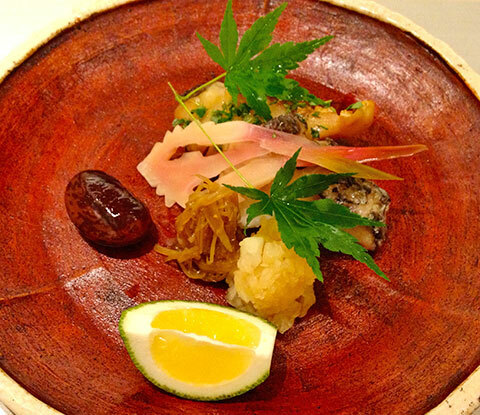 Among the many surprises of his nine-course menu, it’s the grilled sea bream and sea bass course that lingers in my mind, for the way that Saito transformed what could have been a dish featuring two seafood soloists into a harmonious ensemble piece. I loved the sweet, finely shredded burdock, the beautifully carved slices of young ginger, the chunky bits of seasoned daikon and the single butter bean, plump and perfectly seasoned. The chef’s recent experiments with fermented foods pay off spectacularly in a beautiful anmitsu (a dessert of azuki beans, fruit and rice flour dumplings) with sake lees ice cream. Saito, who has another Shichi Jyu Ni Kou in Roppongi, was previously at the helm of kitchens in Tokyo’s Grand Hyatt and Conrad hotels.